Hey, Hampton Roads brides, grooms, and wedding parties all over! If you're in the midst of planning a wedding, you probably know something about a little thing called Pinterest. And as amazing as Pinterest is for organizing our ideas on the screen, wouldn't it be awesome to see those ideas come to life in person? It's your lucky day because guess what's coming to the 757 on March 29th at the Hilton Virginia Beach Oceanfront? 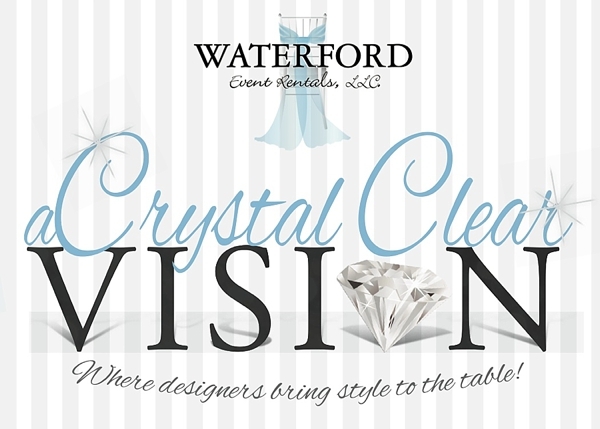 It's the second annual Crystal Clear Vision put on by Waterford Event Rentals, and along with some other fabulous wedding professionals (including some awesome vendor fam! ), Tidewater and Tulle is the media sponsor! Unlike a traditional bridal show, wedding pros are dreaming up beautiful themes and making them realities in the form of wedding reception tablescapes, bridal gowns, and so much more. Guests will be able to walk around, browse, and really hone into what they love and what they want for their big days. It really will be like you're walking through Pinterest! Because it's no secret that we love social media, Tidewater and Tulle tried-and-true photographers, wedding pros, AND you will be connecting all over Instagram! We'll have maps and Instagram handles so you can connect with your favorite designers, get in on the fun, and just have a fun modern spin on what being engaged is all about. Now keep reading because since we're the media sponsor, we have a little hookup for you, readers! We're giving away ten (10) individual tickets (valued at $5 each) for you to come join us! To snag one of these free tickets, all you have to do is head over to the event sponsors' Facebook pages and "like" them! That's it! The more you like, the more chances you have to win. So get to connecting with us, and can't wait to see you there on March 29th! The giveaway ends on Wednesday night, March 18th at 11:59pm, and the winners will be contacted by Waterford Event Rentals on Thursday, March 19th. Winners will be able to pick up tickets at "will call" on the day of the event (March 29, 2015 at the Hilton Virginia Beach Oceanfront); please be sure to bring an ID. Or winners can pick up their tickets at the Waterford Event Rentals office located at 1716 South Park Court, Suite G, Chesapeake VA 23320. 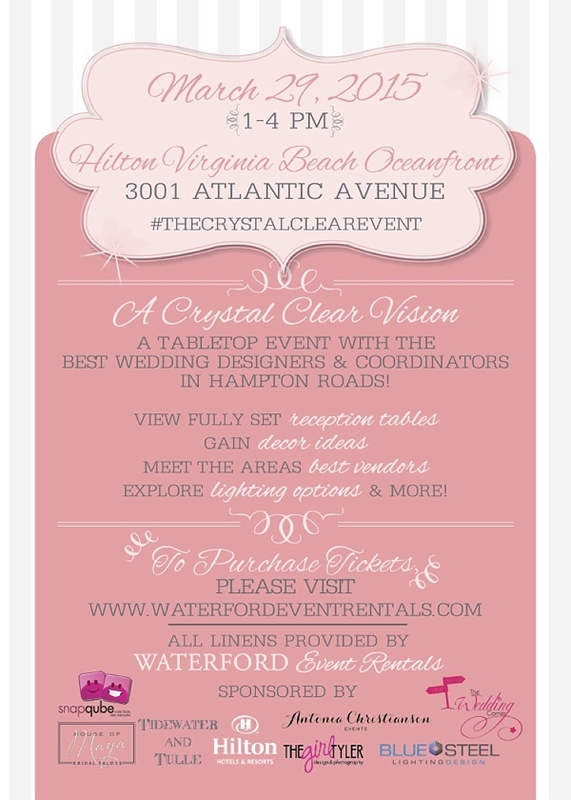 For further information, please contact Waterford Event Rentals by email (info@waterfordeventrentals.com) or by telephone (757-448-5999). To purchase tickets, head over to www.waterfordeventrentals.com. For parking, public garage and valet parking are both available. Not available that day but still want to join in? Follow the #thecrystalclearevent hashtag on Instagram to see everyone's captures to get inspired.